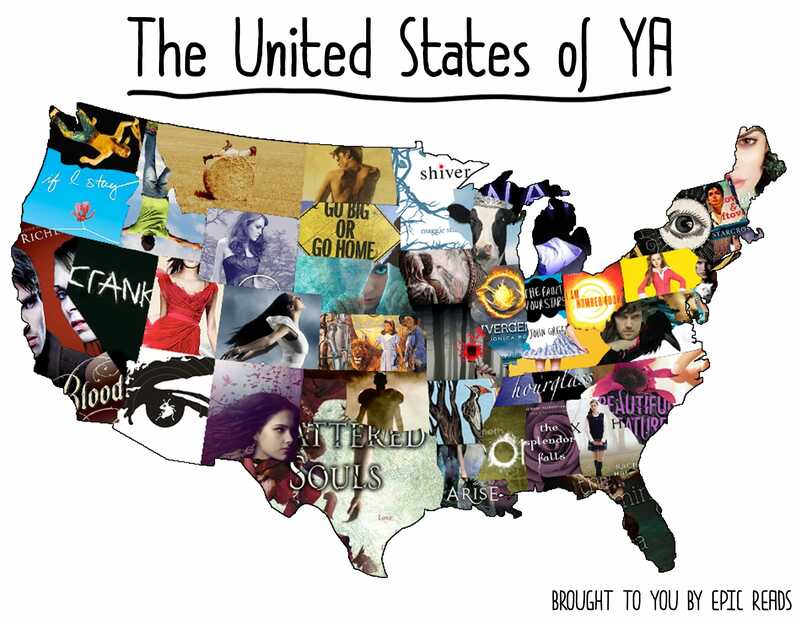 A while back, I posted in the forums asking for people to help me find a YA book for every single state in the US. A lot of you helped me out, and so did this list when I needed to fill in the gaps. I didn’t tell you what I was using the info for, but now I’m finally able to reveal my true intentions. A MAP! Yes, that’s right. I created a map of the United States, picking one book for each state. Browse through, download, print, share the map and don’t forget to tell us how many states you’ve visited through books! How many states have you read? Share with us in the comments or tell us in this poll! Now we’re ready to extend this to the WORLD! Help us with our “Planet YA” project! PS – We made this map for YOU! All of our beautiful (yes, you are all beautiful) readers. So feel free to post on your blogs, Tumblrs, Twitter, libraries, wherever you want! PPS – We do not currently have a print version for the entire image above, but we do have a printable version of just the map part. Click here to view it in full size then right click to save the image and print!